The LIFE Climate CAKE PL project concept has been developed at the National Centre for Emissions Management (KOBiZE), operating as the part of the Institute for Environmental Protection – National Research Institute (IEP-NRI). KOBiZE experts acknowledged the significance of a good quality analytical tools to assess the climate policy impacts, particularly for Poland with its unique dependence on coal. Such a conclusion has also been drawn from the experiences gained in the CAK project (Climate Analysis Centre) implemented jointly with the World Bank in 2012-2016. In this project a global general equilibrium model (CGE) was created, then used to conduct own assessment of the EU climate policy economic impacts. 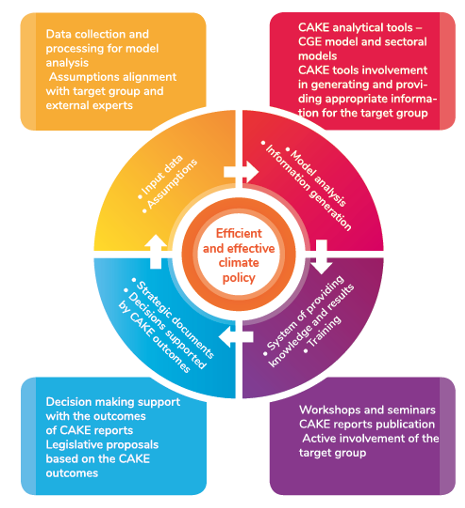 Analytical tools to be developed as part of the LIFE Climate CAKE PL project will significantly extend the possibilities of similar assessments, providing decision-makers and public administration with the knowledge necessary to make reasonable decisions. The project application for co-financing was highly evaluated both by the European Commission in the recruitment in 2016 and the co-financing institution, which is the National Fund for Environmental Protection and Water Management (NFOŚiGW). Grant agreement providing co-financing to LIFE Climate CAKE PL project from both the European Commission and the National Fund for Environmental Protection and Water Management was signed on 27th July, 2017, in the presence of Paweł Sałek, the deputy minister of environment, the government’s plenipotentiary for climate policy. The value of the project is PLN 10,4 million The EC support amounts to approx. PLN 6,16 million, while co-financing from the NFOŚiGW is PLN 2,09 million. The project has been implemented from September 2017 to November 2020.